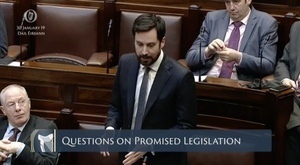 Sinn Féin leader Mary Lou McDonald recalled the Housing Minister Eoghan Murphy saying yesterday that, because of the “cold snap” and the current cold weather initiative being in place, there’s an emergency bed available for everyone who needs one. She then went on to say Inner City Helping Homeless outreach volunteers found there were no beds available for 86 homeless people in Dublin last night at 11.30pm and they subsequently slept rough. “I think we do have to be careful, addressing this situation at the moment with the cold weather initiative, that is in place, that we make sure that the information that we are getting is accurate. 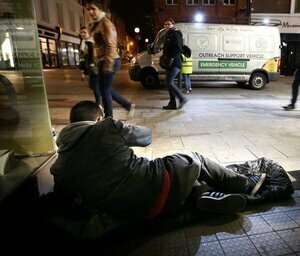 “We work with a number of NGO partner organisations to make sure that in these types of events, when there is severe cold weather, that outreach group teams from all of the organisations are out and working with the Dublin Regional Homeless Executive to get people into safe, secure accommodation. “Over the course of the last number of months, we’ve been putting in place an additional 200 permanent new beds into the system, plus 150 emergency beds as well. “And the outreach teams are out to get people into accommodation and no one will be turned away. Posted in Misc and tagged cold weather initiative, Dublin, Homelessness at 1:30 pm on January 30, 2019 by Bodger.